Fashions of the 1870s were elaborately made and richly trimmed; volumes of material were used with flounce over flounce and tunic over tunic. In spite of the abandonment of the mid-nineteenth century crinoline’s monstrous bell-shaped curves, the 1870s woman was still unable to reap the full benefit of her emancipation. She could not dispense with a redundancy in some part or other of her attire. 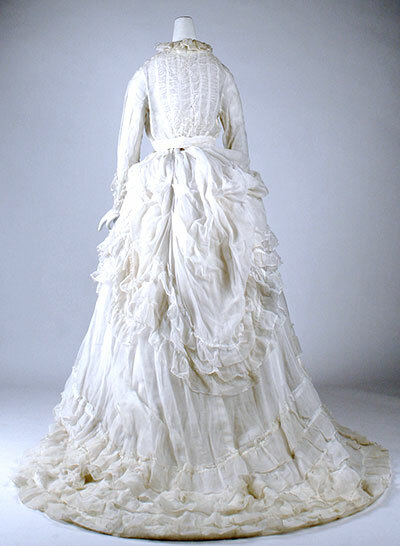 In the early 1870s the skirt, its front almost straight, blossomed out behind into a mountainous mass of folds. It was lavishly decorated with horizontal panels, finished at the hem with vertical pleating and trimmed with several wide flounces of lace or tucked and ruched bands of its own material. 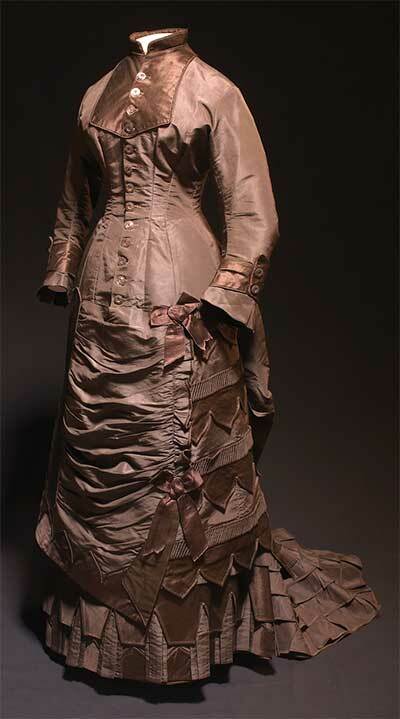 Gray figured silk three piece 1870s dress with brown and white woven flower sprays. There is a long sleeve bodice, an ribbon trimmed overskirt and a fully lined skirt. The bodice and sleeves are lined with ivory linen. The front bodice fastens with hooks and has six gray silk decorative buttons. The overskirt and bodice are trimmed with wide brown silk ribbon. These backward-drawn draperies were accentuated by the little “coat-tail” effect of the bodice, or by sash ends, tied in large bows, which appeared to hold up a vast puff of drapery, or by frills or ruffles, across the back of the skirt. The polonaise itself emphasized this line, being drawn up in multitudinous rich folds, sometimes set off with a little bow at the back of the waist, of which the ends cascaded formally, down over the loopings beneath. LEFT: The ball dress is composed of a trained skirt of white silk, covered entirely with plaited flounces of white gauze; a drapery of blue silk, placed en tablier, is trimmed round with wide blonde or point d’Alencon, the heading to which is a wreath of pink roses with foliage. The body, “Isabeau,” is laced up the back with flat basques rounded front and back, and raised slightly on the hips, trimmed all round with blonde or lace; a large bouquet is placed at the back on the basque, just above the lace, from which falls a long wreath of roses, reaching nearly to the bottom flounce. Low round body, trimmed with a berthe of lace or blonde, and a wreath of roses, with bouquet of the same in front and on the shoulders. Chemisette of plaited gauze, drawn with a fine silk cord. Necklace, three rows of pearls. Coiffure a I’antique with wreath of roses and trail. Half long gloves. “Louis XV” fan, and shoes of white silk with blonde bows and roses. RIGHT: Toilette of faille jonquille and blonde worked with white jet. The trained skirt is set in at the waist in four double plaits, very deep, forming a fan to the bottom of the skirt; two wide bows and square ends, simply crossed and edged with narrow blonde, placed just below the basque at the back. The front is plaited horizontally, trimmed up each side with a wide bouillonne of the silk edged with double plaitings of silk and blonde. The low round body is laced up the back, and pointed in front; the basque is plain and round at the back, and hangs in a long end on each side, edged round with wide blonde, an elegant wreath of mountain ash falling down the center. The body is trimmed round the top with a bouillonne of silk edged with blonde, a wreath of mountain ash with bouquets of the same on the shoulders and in front. Chemisette of plaited crape. Headdress, diadem of flowers with trail falling over the back hair. “Louis XV” shoes of satin, trimmed with blonde. White kid gloves fastened with eight buttons. Silk, velvet, beads, and fur were used, including yards of flossy silk fringe. Buttons were fancy with a silk network over them. A great deal of piece-velvet of the same color as the dress was introduced; bands of velvet some half-yard deep were carried across the front breadths, confining the fullness at the back, where they terminated in bows and sash ends. The skirts were inordinately long and were tied back tightly, giving the appearance of swathing the figure in front. The flounces on the skirt were generally wide at the back and gathered, being edged with narrow frills, plaited all one way and caught down only half the length. Puffings at the side were sometimes used, in addition to side trimmings. At times, the bodices had basques, and were generally made as sleeveless jackets of velvet or of the shade of the material intermixed with the rest of the costume. Sometimes they had revers, or pointed collars at the throat, made of plaited silk, or they were fastened down the front with bands and buttons crossing each other. Violin backs were also the fashion, that is, a piece in the V shape, differing from the rest, and introduced into the back. The sleeves were fit closely to the arm, with cuffs and buttons. LEFT: Toilette of grey silk. The skirt, slightly trained, is trimmed at the back with one wide crossway flounce, quite scanty, surmounted by three narrow bouillonnes. Rather more than half way up, between these and the waist are placed three more bouillonnes the same width, drawn just tight enough to form a slight pouff below the waist. High plain body, forme “Princesse” in front en tablier quite flat, trimmed at each side with beaded passementerie a shade or two darker than the silk. The body is made with revers, trimmed with passementerie, as is the back, round the arm-holes and collar. At the back of the waist, which is round, are placed two long loop bows of silk, with crossing of the same. The sleeves, which are plain, and fitting at the top, are trimmed with two wide frills of plaited silk falling over the hand, with a heading of passementerie. Undersleeves and frill of plaited muslin. Black felt hat, trimmed with a dahlia in front and long grey feather. RIGHT: Costume of velvet and silk, for slight mourning. Dress of black silk, slightly trained, trimmed with a wide plaited flounce, surmounted by three narrow bouillonnes. A little above is a second flounce, also plaited, but not more than half the width, with three narrow bouillonnes. The “Princesse” body has a short rounded basque at the back, open with revers in front, fastened with buttons to the bottom of the tablier, which reaches to the top of the lower flounce. The tablier is trimmed with two narrow plaited flounces of faille, the same trimming carried round the basque, which is held up by a sash of velvet made with two very long hanging bows and two wide ends cut crossway at the ends, but perfectly plain. A frill of plaited silk round the opening of the body, with one of muslin under. The sleeves, which, like the body and tablier, are of black velvet, are plain and nearly tight; they are trimmed from the wrist with four narrow bouillonnes of silk, and a rosette of the same at the wrist and elbow. Undersleeve of plaited muslin. “Marie Stuart” toque of black velvet trimmed with a bouillonne of faille and jet fringe; long veil of crepe lisse. The robe a la polonaise had almost an eighteenth-century flavor, its closely fitted bodice and looped-up skirt (frequently held by large bows of rich ribbon with hanging ends) over a contrasting underskirt giving an effect not unlike the pannier dresses of the eighteenth century. The use of broad and handsome ribbons, in profusion, was very customary at this time; and narrower ribbons, pleated or ruched, tied with fringe, innumerable small buttons, and elaborate braiding in the trimming of all garments. It fell to the beautiful Alexandra, Princess of Wales, to inaugurate the next marked change in the mode. The robe a la Princesse, with its slim waist at the natural level and slender flowing lines, may be attributed directly to her taste. The suavity and grace of this new mode, as contrasted with the extravagances of the crinoline, maintained their influence for many years, although by the early eighties bustles had returned to mar the earlier simplicity. The Princess robe, strictly speaking, was cut without any seam at the waist, and molded the figure from neck to hip, where it flowed on in sweeping draperies; but the influence of this style was so strong that even when a dress was made with a separate bodice and skirt the line remained essentially the same, with its smoothly fitted sweep from shoulder to hip, no matter how elaborate the drapings of the skirt might be. From 1875 onwards this feeling is strongly stressed. LEFT: Toilette de chateau, composed of rose-colored poult de soie, and a very pale salmon figured cashmere. The skirt is of silk and trimmed round with a plaited flounce, gradually increasing in width at the back breadths. “Princesse” polonaise of cashmere, very long, and trimmed round the bottom with a fancy galon and ball fringe. The polonaise is made to fit by seams, and is buttoned down the front. The upper part of the side breadths is gathered under the back, so as to slightly drape. The back breadths are fastened at the waist, and hang down between, and are trimmed with galon. This galon meets at the waist, and is carried over the shoulders en bretelles, and down the front with a pink silk revers. The sleeves are open at the back, trimmed round with galon over a pink silk cuff, which is laid on in plaits behind, showing through the opening, at the bottom of which they are held together by a narrow bias band. “Watteau” bonnet of pink silk, the crown nearly covered with feathers; the brim trimmed underneath with lace and hortensia. Cream-colored lace is put full across the back, and forms strings, which cross in front. RIGHT: Costume of faille and crepon de Chine, of a mauve color, trimmed with velvet of a deeper shade. The skirt is of silk, and has a flounce made in plaits, caught two together by a kind of small puff nearly in the center. The width of the flounce is increased towards the back. Tablier draped in plaits at the sides, and trimmed down the front with three velvet bows. Two pointed ends, trimmed round with velvet, matching the tablier, are formed into long bows and ends at the back. Long wide velvet bows and ends at the side. Corsage buttoned in front, made with a plain basque, simply trimmed with two rows of bias velvet, and with two bows in front. Tight sleeve, ending in a wide double cuff, with a band of velvet fastened under a bow at the back. Capote of China crape, trimmed with velvet and feathers, and a bird placed on one side. A plaiting of crepe lisse is placed round under the brim.